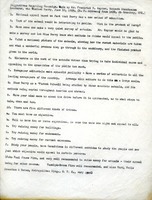 A list of suggestions made by Mr. Frederick Snyder regarding fund raising campaign. Snyder urges Berry to move away from fund raising appeals focused on the needs of individual children to broaden the appeal. He also urges that money not just be raised for scholarships but also for buildings, the endowment, and current expenses.